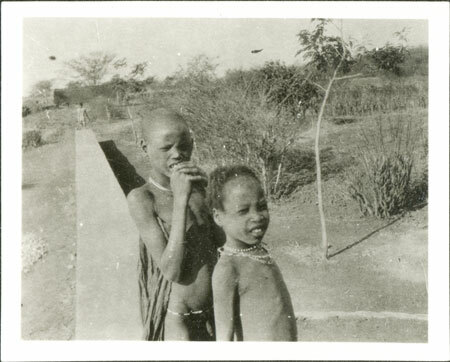 Two children standing near a wall wearing beaded neck ornaments. The wall and planted trees lead on to what could be a garden further away, probably associated with the American Presbytarian Mission station building at Nasir. Note on print reverse ms pencil - "1 199 "
Morton, Chris. "Nuer children at ?mission station" Southern Sudan Project (in development). 03 Jan. 2006. Pitt Rivers Museum. <http://southernsudan.prm.ox.ac.uk/details/1998.346.199.2/>.